There is no longer a Bald Mountain. The highpoint, which at one time was the site of a ski club, eventually became part of a landfill and met its fate at the front end of a bulldozer. But the so-called mountain is remembered 2 miles to the north in Bald Mountain Recreation Area, whose 4,692 acres preserve some of the steepest hills and most rugged terrain in Oakland County. The park is three separate units located south and east of the community of Lake Orion. The unit west of M-24 is mostly old farmland with no developed facilities. The units east of M-24 are the rugged areas of Bald Mountain with a terrain of both open fields and forests of hardwoods and conifers. There are 17 lakes in these units, two trout streams and a topography that offers some interesting opportunities for hikers, mountain bikers and cross country skiers. The park has a total of 15 miles of maintained trails located in the North and South Units east of M-24. In the South Unit, the Red Loop is a 4.8-mile circular trail that passes several ponds and marsh areas and crosses Spring Creek. It can be entered from a car park on Greenshield Road or from Kern Road and crossover spurs allow you to shorten the walk or to begin it near the park headquarters on Greenshield Road. The park’s best hiking is found in the North Unit, where there are 8 miles of trail on both sides of Harmon Road, north of Stoney Creek Road. 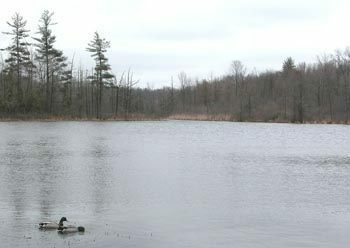 The White Loop is a 2.1-mile walk past several small lakes west of Harmon Road. Branching off it is the Blue Loop and when combined they create a 3.6-mile walk. East of Harmon Road is the Graham Lakes Trail, also known as the Orange Loop, a 3.6-mile hike around six lakes, including East and West Graham lakes and over several high points. There are several parking lots for trail users with the main one for the White Loop at the junction of Harmon and Predmore roads and another for the Orange Loop at the corner of Harmon and Miller Roads. A small portion of Paint Creek Trail also passes through Bald Mountain and can be picked up where Clarkston Road crosses the creek. Paint Creek was Michigan's first rail-trail and today it's probably the most popular one, used by hikers, joggers, mountain bikers and equestrians. Both the north unit and south unit loops are open to mountain bikers, a popular activity in the park. Most cyclists prefer the north unit trails, especially the 3.6-mile Orange Loop as it features more challenging downhill runs and climbs. 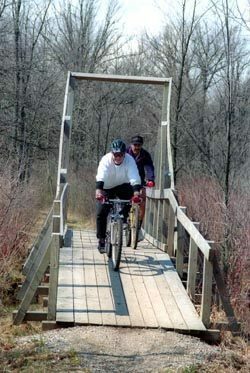 Some mountain bikers combine the south unit trail with a portion of the Paint Creek Trail for an interesting ride. Where the rail-trail crosses Clarkston Road, bikers can depart south on Kern Road and in a quarter mile reach the park's organization campground where there is a trailhead to the south unit's Red Loop. The park’s main day-use area are the picnic and swimming facilities around Lower and Upper Trout lakes. The area is reached from M-24 and contains a beach, bathhouse and picnic area on Lower Trout Lake and additional picnic tables, grills and shelters that can be rented on Upper Trout Lake. Bald Mountain also features a pair of 20-bunk rustic cabins reached from Harmon Road in the north unit. 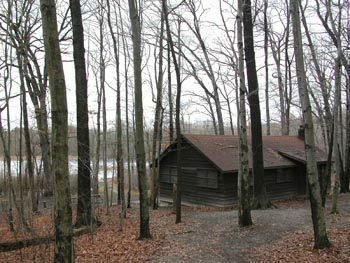 The cabins, a short walk from the parking area, are within 100 yards of each other in a wooded area overlooking Tamarack Lake. Nearby is the White Loop trail. 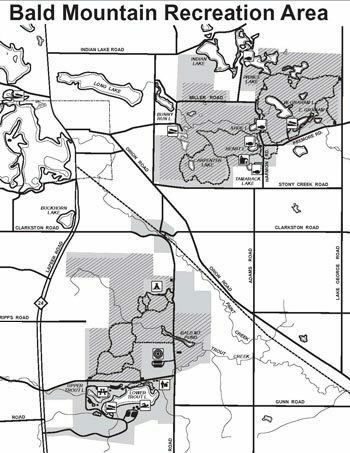 North Unit trails are located east of Lake Orion. From I-75, depart north onto M-24 (exit 81) and in seven miles turn east onto Clarkston Road. Follow the scenic dirt road as it jogs across Paint Creek and pass Orion Road. Turn north (left) on Adams Road and then east (right) on Stoney Creek Road briefly and then north (left) on Harmon Road which leads into the park. There are four trailheads and parking areas to the loop, including one at the end of Harmon Road, another near the corner of Predmore and Lake George Road, and a third further north on Lake George Road.. The trailhead is a half mile north on Harmon.